After the leak of 64-bit (x64) version of Windows 7 RTM Build 7600.16384 English version, the Chinese leaker mspcbeta or msins71 decided to upload and share Simplified Chinese (zh-CN) version of 32-bit (x86) Windows 7 Build 7600.16384. 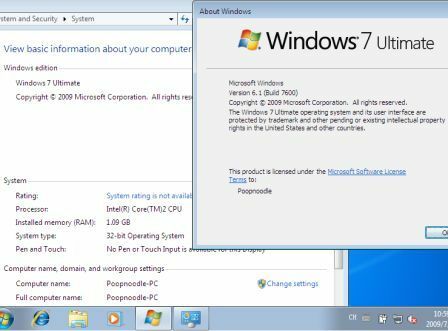 Even though it’s Simplified Chinese version, an English language pack (MUI) for 32-bit Windows 7 Build 7600.16384 has also been leaked to convert the installed system to English user interface, or integrate and slipstream into the installation DVD/ISO. Do note that Windows 7 Build 7600.16384 is not the final RTM build for Windows 7, which likely to be Windows 7 RTM Build 7600.16385. The initial leak of Windows 7 Ultimate 32-bit Simplified Chinese retail version comes in 6 parts of torrent download in 200 MB RAR archives, and the BT torrent to download to download full complete DVD ISO of Windows has since available. To convert the Simplified Chinese GUI to English, download the following x86 English MUI language pack (LIP) for Windows 7 Build 7600.16384: Win_7_EN_MUI_32Bit.msi. Just double click on the .MSI installer to install the language pack. If you don’t understand Chinese language, here’s the illustrative guide to install the language pack and change the user interface display language.